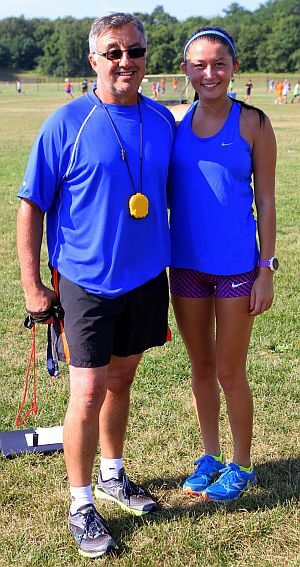 GTD: How did your high school coach and Coach Braz coordinate your training? Tia: My high school coach was very lenient and supportive of me working with Fernando because he knew how good of a coach Fernando is. When Fernando sent me my weekly schedule he often sent it to my high school coach too which was nice so my coach was always in the loop with what I was doing. Since I was a captain, my high school coach wanted me to be at team practice understandably, however he did allow me to go to Peabody once during the school week and once over the weekend to be able to actually work with Fernando, which I really appreciated. GTD: Tell us about a typical training week. Tia: I don't remember a weekly schedule exactly, however, I can't forget the weekly long run that took place almost always on Saturdays (as long as there wasn't a meet on that day). Other than that I usually got in two or three workouts a week. Usually when I had a dual meet (depending on the competition) Fernando would have me run the meet as a workout and then even add on hills or extra mileage after the race. GTD: How did you communicate with Coach Braz? Tia: My weekly schedules were always sent out over email. However, when I had questions about a workout or if he had questions for me about how a workout went, we usually discussed over text. Before my races, even if it was just a dual meet, Fernando would have me call him. The phone call with him -- which was usually a reminder of how I should strategize the race -- was ALWAYS calming, even though I usually get nervous even thinking about a race right before I'm about to run it. GTD: Tell us about the highlights of the training program. Tia: My favorite thing about the training program was finally feeling like I had a team, an amazing team! I have met so many talented runners, and have made friends that go beyond our bond over running. It was so nice to meet and run with people who care so much and work so hard at the same thing as me, something I am not used to. At big races like States or invitationals, it was so comforting to see people I trained with and during warmups, while running the race, and even looking at the results after a race, I find myself caring about these people and their performance as if they were actually my teammates. GTD: What didn't work out so well? How did you and Coach Braz handle things that didn't work. Tia: For things that didn't work for the program I would say that I wish I was able to work in person with Fernando more than twice a week but I did have a obligation to lead my team. I guess you could say we handled it this way. On workouts when I couldn't be at the same track as Fernando, he still gave me the workouts with every detail necessary for me to carry out by myself. For a racing related thing that didn't work out for me, I guess I would say it was the fact that I was not mentally tough. I still think I could be a lot tougher. However, Fernando did help me come a long way. He would give me workouts designed to improve my mentality and even did small things, like not tell me how many more repeats or not tell us how much longer while doing core, that make such a difference. Also just the phone calls before the race helped me a lot because when he told me my game plan for the race he didn't make it sound scary or nerve racking, although he did push me to step out of my comfort zone for the race. He made it sound like any other workout and assured me that I was perfectly capable of doing it. GTD: Did you talk with Coach Braz about your college plans, and your desire to run in college? Tia: Yes I kept him updated with the whole recruiting process. We often met up a couple times just to go over what schools I was seriously interested in, what coaches I have been in contact with, what official visits I had planned. In fact, a lot of my communication with coaches I owe to him, because when I gave him a list of schools that I was seriously considering he got in touch with and emailed each of the coaches a really nice email about my work ethic which definitely meant a lot coming from him. His involvement was just enough, and I never felt like he was taking over or pushing a certain path for me. He listened to what I myself was interested in and then would put in any effort he could to help me. GTD: How did you and Coach Braz manage your summer program in conjunction with your college program? Tia: This summer actually worked out really awesome. There were only about three days throughout the whole camp where I was stuck doing a workout on my own. During the summer I received a schedule from my college coach that was organized by the week, indicating how many miles to hit each week with a daily schedule of what the workout/run was. I forwarded my college program to Fernando and he found a way to make it work with his camp, which was great because that meant I wouldn't be doing my training alone. There was rarely any conflict, if anything I would just switch around the order of the days, like do the tempo on Monday instead of Wednesday and move hills to Wednesday instead of Monday, in order to be able to work with the GTD schedule. I was almost always able to be doing the same workout as the rest of the camp, in the same area, using the same cones, just sometimes my training program would require a slight alteration, like maybe going longer, or maybe going faster than what Fernando had planned for the rest of the camp, but overall I never felt isolated or alone and I most definitely never felt overwhelmed. Something else I am really grateful for besides being able to still feel like part of the camp, is all the extra strength and conditioning drills that the camp provided that were nowhere to be found in my college training program! It's all the little things, like hurdles, stretching, drills with the bands, and core, that I would not have been so diligently doing if it were not for the camp and honestly those have probably had such an impact on making me stay healthy throughout this whole transition into the college training. GTD: How did your first college xc season go? Tia: My first college season was short to say the least. I think I only ran four races? However, as short as the season was for me I am very happy with myself. Something I consider to be an accomplishment in itself is that I stayed injury-free which is hard to do during the whole transition, so I'm proud of that. Also, I have gotten faster and finally broke 19 at Franklin Park which has been a goal of mine for a while. Another thing is that I have been the only freshman to finish all of the workouts (a minuscule thing I noticed and probably not a big deal) but it's another thing I am really proud of, because these workouts get HARD. I brought this up to Fernando and he simply said it's because I have been trained not to make excuses. Which is true, he really has made me into a tougher runner! Tia: Yes, so as of right now I am a Biology major on the pre-dental track. My first semester schedule was full of a bunch of general freshman classes so I haven't had too much focus on Biology, but I just picked second semester classes and it's all full of sciences. So I'll have a better idea at the end of the year, but at least I can change my major as many times as I want from now until the end of sophomore year!